Football player with helmet and football. 2 What Games Did Children Play in Colonial Times? Before the 1950s, football players rarely wore face masks, and some, such as punters and quarterbacks, were slow to adopt them even as they started to gain acceptance. When players did begin to wear them, they often tweaked them to their personal preferences, further complicating the face mask's evolution. In the 1920s, players wore nose guards as their only means of facial protection. Made of leather, they evolved in the 1930s to cover a player's entire face with holes cut out for the eyes and mouth. They were hot and uncomfortable, and players were understandably reluctant to use them. The helmet manufacturer Riddell created the first modern face mask for Otto Graham, a quarterback with the Cleveland Browns, in 1953. Legend has it that Graham took an elbow to the teeth in the course of play, and he decided enough was enough. His coach taped some plastic to the front of his helmet, and a few weeks later, Riddell produced a helmet with a permanent shield of Lucite across the front. Graham's Lucite face mask proved to be impractical because the Lucite shattered on impact, cutting players and spraying Lucite fragments in their eyes. 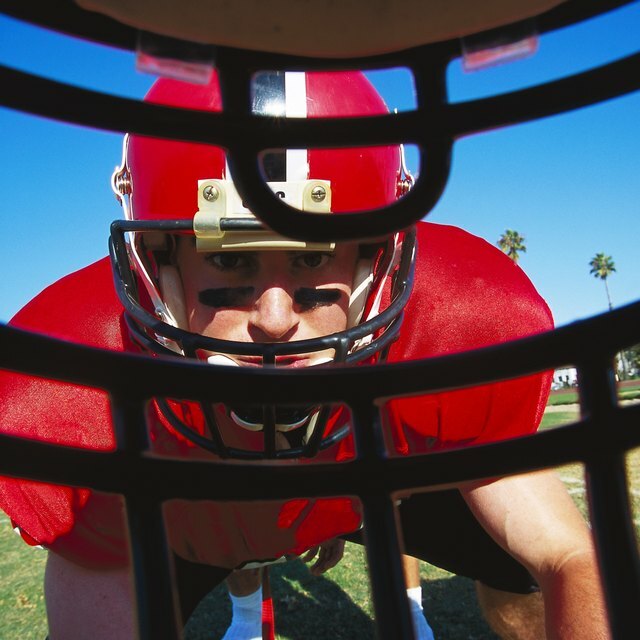 The NFL outlawed the substance for use in football helmets in 1957. Riddell's next helmet to include any sort of face mask was the BT-5. It involved just a single bar across the front of the helmet, made of rubber and plastic. The BT-5 gave way to a series of improvements over that single bar. Double bars, then triple bars, followed, with some linemen wearing entire cage-like coverings over their faces. Riddell made S-Bar face masks with a special protective eye covering as of 2010, but face masks are still individualized to players' preferences and can involve different patterns of several bars. In the 1960s, Otis Taylor of the Kansas City Chiefs reportedly bolted two face masks onto his helmet simultaneously for ultimate protection. Joe Theismann, quarterback for the Washington Redskins, preferred the old-style one-bar face masks so much that when Riddell stopped producing them, he bent the bar backward and downward on the new version so he could still see the playing field without obstruction. Some players, however, bent the bar upward to protect their noses better. In 1974, the Kansas City Chiefs had their face masks painted white to contrast with players' hands so that officials could plainly see when an opposing player grabbed one. The NFL ruled for the first time in 1956 that it was illegal for one player to grab another by his face mask -- except if that player was carrying the ball. In 1962, the NFL upgraded the rule to include all players. Tinted visors were officially prohibited as face masks in 1987, except if a player requires one for an optical condition. Up until 2008, inadvertently grabbing a player by his face mask brought a five-yard penalty and intentionally grabbing it to stop or bring a player down brought a 15-yard penalty. In 2008, however, the NFL dispensed with the five-yard version. Beverly Bird is a professional writer who is also a practicing paralegal in the areas of divorce and family law. She has offered community workshops for single parents, helping them with the financial and lifestyle issues they often face.